This weekend, a few friends and I got together to make tuffets at my house. Carrie wasn't able to finish, but we have two other happy tuffet makers! Shara's tuffet is beautiful in earthy hand-dyeds. Sarah made a Badger tuffet! Go Bucky! Sarah's husband Chris got into it, too! Here's my tuffet. I plan to add some beaded fringe on the bottom. I got the fabrics from Handloom Batik at the International Quilt Festival in Chicago on my way home from the TuffetSource workshop! Shara's tuffet. We found the perfect button! Sarah's tuffet. She's not into the Badgers at all. My tuffet. I can't wait to put trim around the bottom! We had some repeat tuffeteers at Quintessential Quilts in Reedsburg recently. You know, it's hard to stop at just one, just like potato chips. Big, giant, upholstered potato chips. Jan and Eva bond over power tools. Teens Annie and Samantha put the finishing touches on their tuffets. This is Annie's second tuffet and Samantha's first. They're hooked! Jan, Linda, Eva, Samantha, and Annie show off their work! Annie's second tuffet. She's becoming a real pro! I love the rick rack around the button. It really sets it off. Annie's first tuffet from a previous class (I had forgotten to get a closeup photo of it). She did a great job fussy cutting the deer for the button. Eva's tuffet is happy, happy, happy! Linda's tuffet is soft batiks. She had some help from the girls sewing her panels together. Samantha loves horses so she chose some big prints for her tuffet. Jan used a perfect green fabric to highlight the accents of color in her tuffet stripes. Six lovely ladies finished their tuffets at Quintessential Quilts in Madison Tuesday night. It was, as they say, a dark and stormy night, but their tuffets were bright and fun! And we laughed a lot! Never underestimate the sense of a humor of a woman drilling the button pilot hole on her tuffet. Or making her dimple, for that matter. Jane, Deb, Berdeen, Deb, Linda, and Rose Mary all had a blast! You might notice a theme here. Rose Mary's tuffet. It took a lot of faith for her to trust in the random look. It came out great! I love how the blue makes the button on Deb's tuffet stand out. Jane arranged sixteen different fabric so that they blended from one to another. It's so pretty! This is Berdeen's second tuffet. She has definitely caught the bug! Deb also made a Wisconsin Badger tuffet. I love the chevron fabric! Linda's tuffet is not Bucky Badger, but it is Wisconsin themed! Here's a little more information about the fabric used in the last tuffet. For those of you not from Wisconsin, this is an exclusive line designed by Jeanne Horton and Julie Hendricksen for Windham Fabrics and was available at shops participating in the Wisconsin Quilt Shop Hop. Very cool! If you're curious about the Wisconsin Quilt Shop Hop fabric line and want to see more of it, visit their site here. Well, I'm off to drop my Meg's Garden quilt off at Nancy's Notions so they can be ready for QuiltExpo. then I'm going to Mukwonago to teach Tula Pink's 100 Modern Quilt Blocks at Quilt-agious. I'm having so much fun! We had a different kind of tuffet class this past weekend. Instead of doing two classes separated by a week or two for homework, we had one longer first day and then finished the next. So all of these ladies made their tuffets in two days, despite the high heat and humidity. Lynn and Marlene work diligently on their buttons. Rose Ann and Mary hammer in a few uncooperative staples. Colleen nearing the finish line! Here's the whole group! Mary, Lynn, Marlene, Rose Ann, and Colleen! They all did a great job! All five of these tuffets were made using eight fat quarters. And all of them feature at least a little bit of Kaffe Fassetr (or Brandon, or Philip) fabrics! As you may have heard, I'm going to be giving a lecture at QuiltExpo this September! I'm very excited to do this as it's my first introduction to teaching that isn't through a shop or school. Normally, I give "Rinky Dink" as a three hour hands-on class. I've taught this since roughly 2008 and it's not only the first class I ever taught, it's also one of my most successful classes. People have commented things like, "this was the best class I've ever taken." That meant so much to me! At QuiltExpo, I'm shortening the class to a one hour lecture. The great thing is, you could still take it as a three hour class afterward and benefit greatly from it. So what is this class, you may ask? It's a confidence-building free motion quilting class. I had heard so much from people who had taken a free motion quilting class but were petrified at the idea of actually quilting one of their quilts. Some people thought their machines weren't good enough. Some people had tried but were worried about their stitching not being up to par. This class was made for those people. It's not a replacement for your free motion quilting class at your local shop. It can be taken either before or after you take the "official" free motion class. I like to say that taking free motion quilting is like taking drivers' ed and taking my Rinky Dink class is like driving around in an abandoned parking lot with your older sister. No one will get hurt. In Rinky Dink we don't do feathers. We don't do cables or scrolls or even pebbles. All we do are three or four very basic designs. The idea of the class is to get you used to moving with the machine. At some point you'll get that feeling, that feeling that you've become comfortable and want to do more. This class is to help get you to that point just a little bit more easily. So, if you can't come to my lecture at QuiltExpo (it's all three days and only $10), then be sure to try to catch the full class at an upcoming shop. And if you learned about me through this website, I'd love to hear from you! I took a little hiatus from teaching tuffets last week to take my daughter to a sychronized skating summer camp at the University of Miami in Oxford, Ohio. It was a great experience and I didn't even make one tuffet! But the week before? Two finishes for me! First, the Amy Butler tuffet. It's not all Amy Butler, but it's close. The other one? So fun... a Bucky Badger tuffet! Aren't the painted feet cool? I smell a new profile picture come football and basketball season! Shhhh.... don't tell anyone I went to Michigan! I have two pieces of great news! One is that I'm going to be giving my lecture, "Quilting with Less Stress on a Rinky Dink Machine" at Quilt Expo! If you haven't been to Expo before, it's a great show put on by Nancy Zieman Productions as well as Wisconsin Public Television. This lecture is a great way to learn how to build confidence as you approach quilting your first pieces. It's only $10, and I'm giving the lecture all three days of Expo. Here's a ﻿link ﻿to sign up! 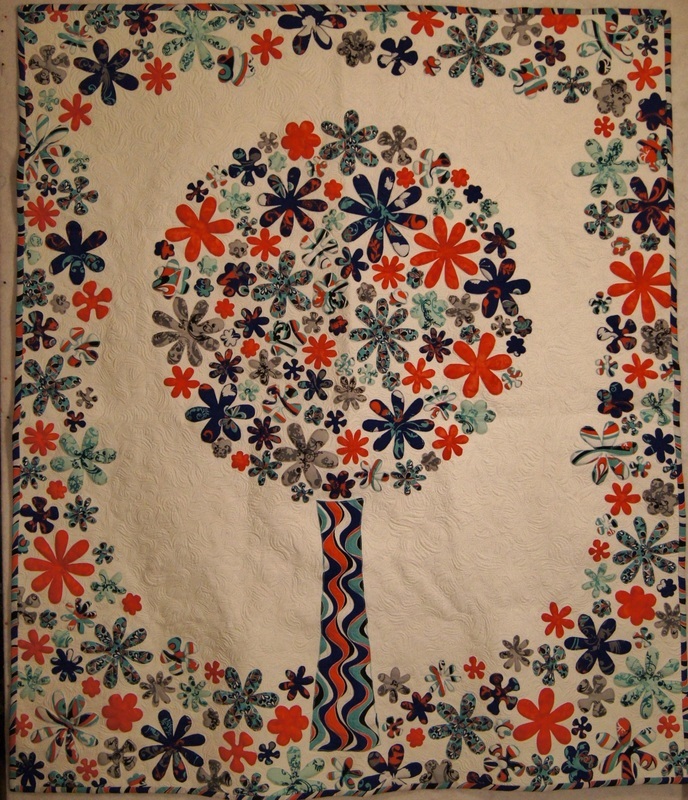 The other news is that my quilt, Meg's Garden, has been accepted into the show as well! I'd love for you to come and see this quilt in person! If you are able to come, please keep an eye out for me! I'd love to say hi!